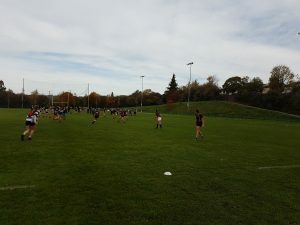 On Tuesday 23rd of October, the Junior and Senior rugby girls travelled to C.I.T for the Munster sevens’ finals. 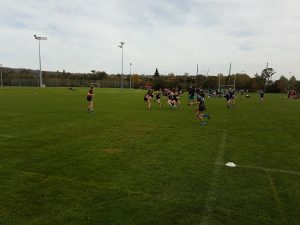 The Junior and Senior teams qualified from the regional finals held at Shannon rugby club the previous week. The senior team had a tough group and knew it would be close in all the games. They had faced many of these teams before in club competitions and were aware of the talent the other teams had. The first game saw a tough contest with old rivals Presentation Thurles and it was Thurles who got the better start going 2-0 up early on. However, Roisin and Naoise Houlihan after some great ball carries both went over for tries before the end of the first half. The second half started in the same way as the first with Pres getting two early scores but Caitlin McEvoy broke their defence going over for a score. With only minutes remaining Leanne Conroy powered over for the final try of the match to end it with a draw 4 tries a piece. The seniors faced on of the tournament favourites, Colaiste Ide & Iosef, in their next game. Again it was another close encounter with the sides staying level for most of the match. Abbeyfeale got the upper hand however and the game ended 4-3 with super tries from Elise McWey and two from Naoise Houlihan. The final game saw the seniors play Skibbereen. Some great team displays in this game with all players working together. 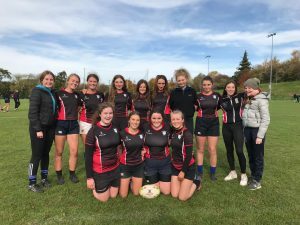 The game ended in a draw, 5-5, with tries from Roisin Houlihan, Leanne Conroy, Elise McWey, Caitlin McEvoy and Aoibheann Ward. Well done to the Senior team who just missed out on a place in the finals. The junior girls began their first match vs Rockwell A. They dominated the game finishing with a score of 10-1. The star player of the match was Enya Slevin who lead the team from the start. The girls then went on to play Colaiste Ide agus Iosef. This was a rematch of a club game so the girls wanted to show their improvement. The girls worked hard as a team to keep their defensive line and it paid off. The match finished with another outstanding score of 8-1. The star player being Anna Hanly. The final game led to be the most intense match of the day. The result determined whether or not the girls would qualify for the All Ireland finals in the Aviva stadium on the 7th of November. After swapping scores throughout the first half, the girls needed to put in a big performance for the second half. Fermoy were first to score but the St. Anne’s girls were determined to come back. After some great team play, Eibhlis Coleman broke through the defence to score. It was all level again. From the restart, the girls kept a strong defensive line and with great team work by Ella Joslin and Zoe Loughran we turned over the ball giving Grainne the space to score. We were up by one. In the last minute of the game, Eibhlis Coleman, our top try scorer, ran the length of the pitch to secure our victory. The game concluded with a close score of 6-4 and victory for the St. Anne’s girls. The star player of this match being Sarah McWey. Eibhlís Coleman was awarded player of the tournament for her tremendous work ethic throughout the day. 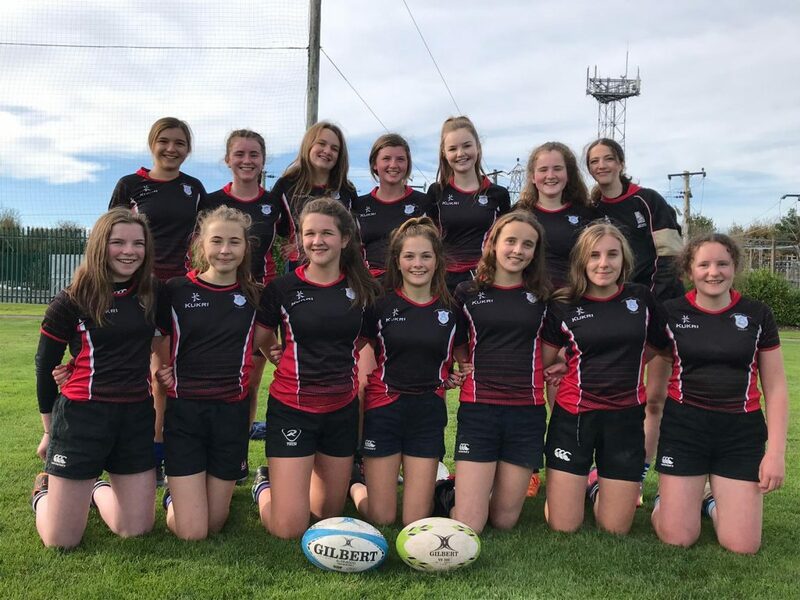 Some of the other try scorers for this tournament were Zoe Loughran, Eibhlís Coleman, Grainne Mahony, Enya Slevin, Ella Joslin and Ellen O’Shaugnessy. The Junior Team will now go on to compete in the All Ireland Final in the Aviva Stadium on November 7th. Article by: Kate Clarke, Aoibheann Ward and Leah O Donovan. By killaloeteacher in Other on October 24, 2018 .